Isolation and separation of specific molecules is used in almost all areas of biosciences and biotechnology. Diverse procedures can be used to achieve this goal. Recently, increased attention has been paid to the development and application of magnetic separation techniques, which employ small magnetic particles. The purpose of this review paper is to summarize various methodologies, strategies and materials which can be used for the isolation and purification of target proteins and peptides with the help of magnetic field. An extensive list of realised purification procedures documents the efficiency of magnetic separation techniques. Isolation, separation and purification of various types of proteins and peptides, as well as of other specific molecules, is used in almost all branches of biosciences and biotechnologies. Separation science and technology is thus very important area necessary for further developments in bio-oriented research and technology. New separation techniques, capable of treating dilute solutions or solutions containing only minute amounts of target molecules in the presence of vast amounts of accompanying compounds in both small and large-scale processes, even in the presence of particulate matter, are necessary. In the area of biosciences and biotechnology the isolation of proteins and peptides is usually performed using variety of chromatography, electrophoretic, ultrafiltration, precipitation and other procedures, affinity chromatography being one of the most important techniques. Affinity ligand techniques represent currently the most powerful tool available to the downstream processing both in term of their selectivity and recovery. The strength of column affinity chromatography has been shown in thousands of successful applications, especially in the laboratory scale. However, the disadvantage of all standard column liquid chromatography procedures is the impossibility of the standard column systems to cope with the samples containing particulate material so they are not suitable for work in early stages of the isolation/purification process where suspended solid and fouling components are present in the sample. In this case magnetic affinity, ion-exchange, hydrophobic or adsorption batch separation processes, applications of magnetically stabilized fluidized beds or magnetically modified two-phase systems have shown their usefulness. The basic principle of batch magnetic separation is very simple. Magnetic carriers bearing an immobilized affinity or hydrophobic ligand or ion-exchange groups, or magnetic biopolymer particles having affinity to the isolated structure, are mixed with a sample containing target compound(s). Samples may be crude cell lysates, whole blood, plasma, ascites fluid, milk, whey, urine, cultivation media, wastes from food and fermentation industry and many others. Following an incubation period when the target compound(s) bind to the magnetic particles the whole magnetic complex is easily and rapidly removed from the sample using an appropriate magnetic separator. After washing out the contaminants, the isolated target compound(s) can be eluted and used for further work. Magnetic separation techniques have several advantages in comparison with standard separation procedures. This process is usually very simple, with only a few handling steps. All the steps of the purification procedure can take place in one single test tube or another vessel. There is no need for expensive liquid chromatography systems, centrifuges, filters or other equipment. The separation process can be performed directly in crude samples containing suspended solid material. In some cases (e.g., isolation of intracellular proteins) it is even possible to integrate the disintegration and separation steps and thus shorten the total separation time . Due to the magnetic properties of magnetic adsorbents (and diamagnetic properties of majority of the contaminating molecules and particles present in the treated sample), they can be relatively easily and selectively removed from the sample. In fact, magnetic separation is the only feasible method for recovery of small magnetic particles (diameter ca 0.1 – 1 μm) in the presence of biological debris and other fouling material of similar size. Moreover, the power and efficiency of magnetic separation procedures is especially useful at large-scale operations. The magnetic separation techniques are also the basis of various automated procedures, especially magnetic-particle based immunoassay systems for the determination of a variety of analytes, among them proteins and peptides. Several automated systems for the separation of proteins or nucleic acids have become available recently. Magnetic separation is usually very gentle to the target proteins or peptides. Even large protein complexes that tend to be broken up by traditional column chromatography techniques may remain intact when using the very gentle magnetic separation procedure . Both the reduced shearing forces and the higher protein concentration throughout the isolation process positively influence the separation process. Separation of target proteins using standard chromatography techniques often leads to the large volume of diluted protein solution. In this case appropriate magnetic particles can be used for their concentration instead of ultrafiltration, precipitation etc. . The purpose of this review is to summarize various methodologies and strategies which can be employed for the isolation and purification of target proteins and peptides with the help of magnetic materials. An extensive list of realised purification procedures documents the efficiency of magnetic separation techniques. All these information will help the scientists to select the optimal magnetic material and the purification procedure. The basic equipment for laboratory experiments is very simple. Magnetic carriers with immobilized affinity or hydrophobic ligands, magnetic particles prepared from a biopolymer exhibiting affinity for the target compound(s) or magnetic ion-exchangers are usually used to perform the isolation procedure. Magnetic separators of different types can be used for magnetic separations, but many times cheap strong permanent magnets are equally efficient, especially in preliminary experiments. Magnetic carriers and adsorbents can be either prepared in the laboratory, or commercially available ones can be used. Such carriers are usually available in the form of magnetic particles prepared from various synthetic polymers, biopolymers or porous glass, or magnetic particles based on the inorganic magnetic materials such as surface modified magnetite can be used. Many of the particles behave like superparamagnetic ones responding to an external magnetic field, but not interacting themselves in the absence of magnetic field. This is important due to the fact that magnetic particles can be easily resuspended and remain in suspension for a long time. In most cases, the diameter of the particles differs from ca 50 nm to approx. 10 μm. However, also larger magnetic affinity particles, with the diameters up to millimetre range, have been successfully used . Magnetic particles having the diameter larger than ca 1 μm can be easily separated using simple magnetic separators, while separation of smaller particles (magnetic colloids with the particle size ranging between tens and hundreds of nanometers) may require the usage of high gradient magnetic separators. Commercially available magnetic particles can be obtained from a variety of companies. In most cases polystyrene is used as a polymer matrix, but carriers based on cellulose, agarose, silica, porous glass or silanized magnetic particles are also available. Examples of magnetic particles used (or usable) for proteins and peptides separation can be found elsewhere [5–7]. Particles with immobilised affinity ligands are available for magnetic affinity adsorption. Streptavidin, antibodies, protein A and Protein G are used most often in the course of protein and peptides isolation. Magnetic particles with above mentioned immobilised ligands can also serve as generic solid phases to which native or modified affinity ligands can be immobilised (e.g., antibodies in the case of immobilised protein A, protein G or secondary antibodies, biotinylated molecules in the case of immobilised streptavidin). Also some other affinity ligands (e.g., nitrilotriacetic acid, glutathione, trypsin, trypsin inhibitor, gelatine etc.) are already immobilised to commercially available carriers. To immobilise other ligands of interest to both commercial and laboratory made magnetic particles standard procedures used in affinity chromatography can be employed. Usually functional groups available on the surface of magnetic particles such as -COOH, -OH or -NH2 are used for immobilisation, in some cases magnetic particles are available already in the activated form (e.g., tosylactivated, epoxyactivated etc). In the laboratory magnetite (or similar magnetic materials such as maghemite or ferrites) particles can be surface modified by silanization. This process modifies the surface of the inorganic particles so that appropriate functional groups become available, which enable easy immobilisation of affinity ligands . In exceptional cases enzyme activity can be decreased as a result of usage of magnetic particles with exposed iron oxides. In this case encapsulated microspheres, having an outer layer of pure polymer, will be safer. Biopolymers such as agarose, chitosan, kappa carrageenan and alginate can be easily prepared in a magnetic form. In the simplest way the biopolymer solution is mixed with magnetic particles and after bulk gel formation the magnetic gel formed is mechanically broken into fine particles . Alternatively biopolymer solution containing dispersed magnetite is dropped into a mixed hardening solution  or water-in-oil suspension technique is used to prepare spherical particles . Basically the same procedures can be used to prepare magnetic particles from synthetic polymers such as polyacrylamide, poly(vinylalcohol) and many others . In another approach used standard affinity or ion-exchange chromatography material was post-magnetised by interaction of the sorbent with water-based ferrofluid. Magnetic particles accumulated within the pores of chromatography adsorbent thus modifying this material into magnetic form [12, 13]. Alternatively magnetic Sepharose or other agarose gels were prepared by simple contact with freshly precipitated or finely powdered magnetite [12, 14]. Magnetoliposomes (magnetic derivatives of standard liposomes), either in the original form or after immobilization of specific proteins, have the potential for the separation of antiphospholipid antibodies , IgG antibodies  and other proteins of interest . Recently also non-spherical magnetic structures, such as magnetic nanorods have been tested as possible adsorbent material for specific separation of target proteins . Magnetic separators are necessary to separate the magnetic particles from the system. In the simplest approach, a small permanent magnet can be used, but various magnetic separators employing strong rare-earth magnets can be obtained at reasonable prices. Commercial laboratory scale batch magnetic separators are usually made from magnets embedded in disinfectant-proof material. The racks are constructed for separations in Eppendorf micro-tubes, standard test tubes or centrifugation cuvettes, some of them have a removable magnetic plate to facilitate easy washing of separated magnetic particles. Other types of separators enable separations from the wells of microtitration plates and the flat magnetic separators are useful for separation from larger volumes of suspensions (up to approx. 500 – 1000 ml). Examples of typical batch magnetic separators are shown in Fig. 1. Examples of batch magnetic separators applicable for magnetic separation of proteins and peptides. 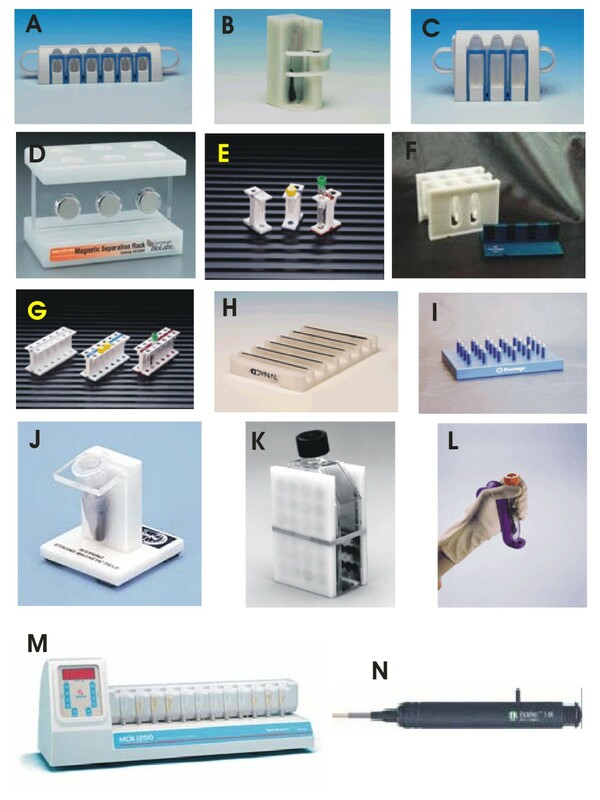 A: Dynal MPC -S for six microtubes (Dynal, Norway); B: Dynal MPC – 1 for one test tube (Dynal, Norway); C: Dynal MPC – L for six test tubes (Dynal, Norway); D: magnetic separator for six Eppendorf tubes (New England BioLabs, USA); E: MagneSphere Technology Magnetic Separation Stand, two position (Promega, USA); F: MagnaBot Large Volume Magnetic Separation Device (Promega, USA); G: MagneSphere Technology Magnetic Separation Stand, twelve-position (Promega, USA); H: Dynal MPC – 96 S for 96-well microtitre plates (Dynal, Norway); I: MagnaBot 96 Magnetic Separation Device for 96-well microtitre plates (Promega, USA); J: BioMag Solo-Sep Microcentrifuge Tube Separator (Polysciences, USA); K: BioMag Flask Separator (Polysciences, USA); L: MagneSil Magnetic Separation Unit (Promega, USA); M: MCB 1200 processing system for 12 microtubes based on MixSep process (Sigris Research, USA); N: PickPen magnetic tool (Bio-Nobile, Finland). Reproduced with the permission of the above mentioned companies; the photos were taken from their www pages. Flow-through magnetic separators are usually more expensive, and high gradient magnetic separators (HGMS) are the typical examples. Laboratory scale HGMS is composed from a column packed with fine magnetic grade stainless steel wool or small steel balls which is placed between the poles of an appropriate magnet. The suspension is pumped through the column, and magnetic particles are retained within the matrix. After removal the column from the magnetic field, the particles are retrieved by flow and usually by gentle vibration of the column. For work in dense suspensions, open gradient magnetic separators may be useful. A very simple experimental set-up for the separation of magnetic affinity adsorbents from litre volumes of suspensions was described . Currently many projects require the analysis of a high number of individual proteins or variants. Therefore, methods are required that allows multiparallel processing of different proteins. There are several multiple systems for high throughput nucleic acid and proteins preparation commercially available. The most often used approach for proteins isolation is based on the isolation and assay of 6xHis-tagged recombinant proteins using magnetic beads with Ni-nitriloacetic acid ligand . The commercially available platforms can be obtained from several companies such as Qiagen, USA (BioRobot and BioSprint series), Tecan, Japan (Te-MagS) or Thermo Electron Corporation, USA (KingFisher). Magnetic separations of proteins and peptides are usually convenient and rapid. Nevertheless, several hints may be helpful to obtain good results. Proteins and peptides in the free form can be directly isolated from different sources. Membrane bound proteins have to be usually solubilized using appropriate detergents. When nuclei are broken during sample preparation, DNA released into the lysate make the sample very viscous. This DNA may be sheared by repeated passage up and down through a 21 gauge hypodermic syringe needle before isolation of a target protein. Alternatively, DNase can be added to enzymatically digest the DNA. Magnetic beads in many cases exhibit low non-specific binding of non-target molecules present in different samples. Certain samples may still require preclearing to remove molecules which have high non-specific binding activity. If preclearing is needed, the sample can be mixed with magnetic beads not coated with the affinity ligand. In the case of immunomagnetic separation, magnetic beads coated with secondary antibody or with irrelevant antibodies have been used. The non-specific binding can also be minimised by adding a non-ionic detergent both in the sample and in the washing buffers after isolation of the target. In general, magnetic affinity separations can be performed in two different modes. In the direct method, an appropriate affinity ligand is directly coupled to the magnetic particles or biopolymer exhibiting the affinity towards target compound(s) is used in the course of preparation of magnetic affinity particles. These particles are added to the sample and target compounds then bind to them. In the indirect method the free affinity ligand (in most cases an appropriate antibody) is added to the solution or suspension to enable the interaction with the target compound. The resulting complex is then captured by appropriate magnetic particles. In case antibodies are used as free affinity ligands, magnetic particles with immobilised secondary antibodies, protein A or protein G are used for capturing of the complex. Alternatively the free affinity ligands can be biotinylated and magnetic particles with immobilised streptavidin or avidin are used to capture the complexes formed. In both methods, magnetic particles with isolated target compound(s) are magnetically separated and then a series of washing steps is performed to remove majority of contaminating compounds and particles. The target compounds are then usually eluted, but for specific applications (especially in molecular biology, bioanalytical chemistry or environmental chemistry) they can be used still attached to the particles, such as in the case of polymerase chain reaction, magnetic ELISA etc. The two methods perform equally well, but, in general, the direct technique is more controllable. The indirect procedure may perform better if affinity ligands have poor affinity for the target compound. In most cases, magnetic batch adsorption is used to perform the separation step. This approach represents the simplest procedure available, enabling to perform the whole separation in one test-tube or flask. If larger magnetic particles (with diameters above ca 1 μm) are used, simple magnetic separators can be employed. In case magnetic colloids (diameters ranging between tens and hundreds of nanometres) are used as affinity adsorbents, high-gradient magnetic separators have usually to be used to remove the magnetic particles from the system. Alternatively magnetically stabilised fluidised beds (MSFB), which enable a continuous separation process, can be used. The use of MSFB is an alternative to conventional column operation, such as packed-bed or fluidised bed, especially for large-scale purification of biological products. Magnetic stabilisation enables the expansion of a packed bed without mixing of solid particles. High column efficiency, low pressure drop and elimination of clogging can be reached [21, 22]. Also non-magnetic chromatographic adsorbents can be stabilized in magnetically stabilized fluidized beds if sufficient amount of magnetically susceptible particles is also present. The minimum amount of magnetic particles necessary to stabilize the bed is a function of various parameters including the size and density of both particles, the magnetic field strength, and the fluidization velocity. A variety of commercially available affinity, ion-exchange, and adsorptive supports can be used in the bed for continuous separations . Biocompatible two phase systems, composed for example from dextran and polyethylene glycol, are often used for isolation of biologically active compounds, subcellular organelles and cells. One of the disadvantages of this system is the slow separation of the phases when large amounts of proteins and cellular components are present. The separation of the phases can be accelerated by the addition of fine magnetic particles or ferrofluids to the system followed by the application of a magnetic field. This method seems to be useful when the two phases have very similar densities, the volumetric ratio between the phases is very high or low, or the systems are viscous. Magnetically enhanced phase separation usually increases the speed of phase separation by a factor of about 10 in well-behaved systems, but it may increase by a factor of many thousands in difficult systems. The addition of ferrofluids and/or iron oxide particles was shown to have usually no influence on enzyme partioning or enzyme activity [24, 25]. Proteins and peptides isolated using magnetic techniques have to be usually eluted from the magnetic separation materials. In most cases bound proteins and peptides can be submitted to standard elution methods such as the change of pH, change of ionic strength, use of polarity reducing agents (e.g., dioxane or ethyleneglycol) or the use of deforming eluents containing chaotropic salts. Affinity elution (e.g., elution of glycoproteins from lectin coated magnetic beads by the addition of free sugar) may be both a very efficient and gentle procedure. Magnetic affinity and ion-exchange separations have been successfully used in various areas, such as molecular biology, biochemistry, immunochemistry, enzymology, analytical chemistry, environmental chemistry etc [26–29]. Tables 1, 2, 3, 4, 5, 6, 7, 8, 9 show some selected applications of these techniques for proteins and peptides isolation. In the case of proteins and peptides purifications, no simple strategy for magnetic affinity separations exists. Various affinity ligands have been immobilised on magnetic particles, or magnetic particles have been prepared from biopolymers exhibiting the affinity for target enzymes or lectins. Immunomagnetic particles, i.e. magnetic particles with immobilised specific antibodies against the target structures, have been used for the isolation of various antigens, both molecules and cells  and can thus be used for the separation of specific proteins. Magnetic separation procedures can be employed in several ways. Preparative isolation of the target protein or peptide is usually necessary if further detailed study is intended. In other cases, however, the magnetic separation can be directly followed (after elution with an appropriate buffer) with SDS electrophoresis. Magnetically separated proteins and peptides can also be used for further mass spectroscopy characterization [30, 31]. The basic principles of magnetic separations can be used in the course of protein or peptide determination using various types of solid phase immunoassays. Usually immunomagnetic particles directly capture the target analyte, or magnetic particles with immobilised streptavidin are used to capture the complex of biotinylated primary antibody and the analyte. The separated analyte is then determined (usually without elution) using an appropriate method. A combination of magnetic separation with affinity capillary electrophoresis is also possible . Enzyme isolation is usually performed using immobilised inhibitors, cofactors, dyes or other suitable ligands, or magnetic beads prepared from affinity biopolymers can be used (see Tables 1, 2, 3, 4). Genetic engineering enables the construction of gene fusions resulting in fusion proteins having the combined properties of the original gene products. To date, a large number of different gene fusion systems, involving fusion partners that range in size from one amino acid to whole proteins, capable of selective interaction with a ligand immobilized onto magnetic particles or chromatography matrices, have been described. In such systems, different types of interactions, such as enzyme-substrate, receptor-target protein, polyhistidines-metal ion, and antibody-antigen, have been utilized. The conditions for purification differ from system to system and the environment tolerated by the target protein is an important factor for deciding which affinity fusion partner to choose. In addition, other factors, including protein localization, costs for the affinity matrix and buffers, and the possibilities of removing the fusion partner by site-specific cleavage, should also be considered [33, 34]. As an example, isolation of recombinant oligohistidine-tagged proteins is based on the application of metal chelate magnetic adsorbents [35, 36]. This method has been used successfully for the purification of proteins expressed in bacterial, mammalian, and insect systems. Antibodies from ascites, serum and tissue culture supernatants can be efficiently isolated using magnetic particles with immobilized Protein A, Protein G or anti-immunoglobulin antibodies. Protein A, isolated from Staphylococcus aureus, binds the Fc region of IgG of most mammalian species with high affinity, leaving antigen specific sites free. Protein G, isolated from Streptococcus sp., reacts with a larger number of IgG isotypes. It has a higher binding affinity to immunoglobulins than Protein A, however, it also interacts with the Fab regions of IgG, although the affinity is ten times lower than for the Fc region . Antiphospholipid antibodies were successfully isolated using magnetoliposomes . Aptamers are DNA or RNA molecules that have been selected from random pools based on their ability to bind other molecules. Aptamers binding proteins can be immobilised to magnetic particles and used for isolation of target proteins. DNA/RNA binding proteins (e.g., promoters, gene regulatory proteins and transcription factors) are often short-lived and in low abundance. A rapid and sensitive method, based on the immobilization of biotinylated DNA/RNA fragments containing the specific binding sequence to the magnetic streptavidin particles, can be used. The bound DNA/RNA binding proteins are usually eluted with high salt buffer or change of pH . Other types of proteins were isolated using specific affinity-based procedures. For example, plasminogen immobilized on magnetic particles was used to separate scrapie and bovine spongiform encephalopathy associated prion protein PrPSc from its conformer which is a cellular protein called PrPC. In fact, plasminogen represents the first endogenous factor discriminating between normal and pathological prion protein. This unexpected property may be exploited for diagnostic purposes [39, 40]. Magnetic separation was also successfully used for the recovery of proteins expressed in the form of inclusion bodies, involving at first chemical extraction from the host cells, then adsorptive capture of the target protein onto small magnetic adsorbents, followed by rapid collection of the product-loaded supports with the aid of high gradient magnetic fields . A new approach for analytical ion-exchange separation of native proteins and proteins enzymatic digest products has been described recently . Magnetite particles were covered with a gold layer and then stabilized with ionic agents. These charged stabilizers present at the surface of the gold particles are capable of attracting oppositely charged species from a sample solution through electrostatic interactions. Au@magnetic particles having negatively charged surfaces are suitable probes for selectively trapping positively charged proteins and peptides from aqueous solutions. The species trapped by the isolated particles were then characterized by matrix-assisted laser desorption/ionization mass spectrometry (MALDI MS) after a simple washing. Magnetic solid phase extraction (MSPE) enables to preconcentrate target analytes from larger volumes of solutions or suspensions using relatively small amount of magnetic specific adsorbent. Up to now this procedure was used for preconcentration of low-molecular weight xenobiotics [42, 43] but using suitable magnetic adsorbents the MSPE could be used to preconcetrate target proteins and peptides as well. Sometimes the removal of certain proteins will reveal functions involving the depleted proteins or will help in the course of subsequent protein isolation. As an example, Dynabeads have been used to remove involved proteins from Xenopus egg extracts for analyses of the cell mitosis mechanisms [44, 45]. Rapid removal of contaminating proteolytic enzymes from the crude samples could increase yields of sensitive proteins due to the limitation of their proteolysis . A combination of mechanical cell disintegration and magnetic batch affinity adsorption was used to simplify the isolation of intracellular proteins. Magnetic glass beads were used because of their hardness and rigidity . An example of quite different protein purification strategy can also be mentioned. Proteins associated with the endocytic vesicles of Dictyostelium discoideum were separated after magnetic isolation of the vesicles that was accomplished by feeding the amoebae with dextran-stabilized iron oxide particles. The cells were broken, the labelled vesicles were magnetically separated and then disrupted to release proteins which were resolved by SDS-PAGE. After „in-gel“ digestion with endoproteinase Lys-C or Asp-N the generated peptides were used for amino acid sequencing. This strategy allowed the identification of the major protein constituents of the vesicles . Analogous procedure was used for the separation and study of peroxisomes proteins when at first peroxisomes were separated using magnetic beads with immobilized specific antibodies and then the protein content of the separated peroxisomes was analysed . Standard liquid column chromatography is currently the most often used technique for the isolation and purification of target proteins and peptides. Magnetic separation techniques are relatively new and still under development. Magnetic affinity particles are currently used mainly in molecular biology (especially for nucleic acids separation), cell biology and microbiology (separation of target cells) and as parts of the procedures for the determination of selected analytes using magnetic ELISA and related techniques (especially determination of clinical markers and environmental contaminants). Up to now separations in small scale prevail and thus the full potential of these techniques has not been fully exploited. It can be expected that further development will be focused at least on two areas. The first one will be focused on the laboratory scale application of magnetic affinity separation techniques in biochemistry and related areas (rapid isolation of a variety of both low- and high-molecular weight substances of various origin directly from crude samples thus reducing the number of purification steps) and in biochemical analysis (application of immunomagnetic particles for separation of target proteins from the mixture followed by their detection using ELISA and related principles). Such a type of analysis will enable to construct portable assay systems enabling e.g. near-patient analysis of various protein disease markers. New methodologies, such as the application of chip and microfluidics technologies, may result in the development of magnetic separation processes capable of magnetic separation and detection of extremely small amount of target biologically active compounds . In the second area, larger-scale (industrial) systems are believed to be developed and used for the isolation of biologically active compounds directly from crude culture media, wastes from food industry etc., integrating three classical steps (clarification, concentration and initial purification) into a single unit operation . It is not expected that extremely large amounts of low cost products will be isolated using magnetic techniques, but the attention should be focused onto the isolation of minor, but highly valuable components present in raw materials. Of course, prices of magnetic carriers have to be lowered and special types of low-cost, biotechnology applicable magnetic carriers and adsorbents prepared by simple and cheap procedures have to become available. The existence of inexpensive and effective magnetic separators enabling large-scale operations is necessary, as well. In the near future quite new separation strategies can appear. A novel magnetic separation method, which utilizes the magneto-Archimedes levitation, has been described recently and applied to separation of biological materials. By using the feature that the stable levitation position under a magnetic field depends on the density and magnetic susceptibility of materials, it was possible to separate biological materials such as haemoglobin, fibrinogen, cholesterol, and so on. So far, the difference of magnetic properties was not utilized for the separation of biological materials. Magneto-Archimedes separation may be another way for biological materials separation . It can be expected that magnetic separations will be used regularly both in biochemical laboratories and biotechnology industry in the near future. The research is a part of ILE Research Intention No. AV0Z6087904. The work was supported by the Ministry of Education of the Czech Republic (Project No. ME 583) and Grant Agency of the Czech Academy of Sciences (Project No. IBS6087204).